I thought today I might go back to my roots a little, if you will, and write about one of the forgeries that I came across while writing my undergraduate dissertation. This one is particular near and dear to me, because it afforded me one of my first opportunities to appreciate how easiy art forgeries can get swept into the general cannon of an artist and thereby make it incredibly to set the record straight. But first, I thought I should give you a little bit of background on this guy, since I have somehow managed to not cover him on this blog just yet. Eric Hebborn (1934-1996) was an art forger active during the 1960s and 70s, who made a particular career for himself forging drawings. This is an important point to make, because at the time drawings were considered the bottom end of the market, and did not have half the regulatory oversights (such as they were) that paintings had for example. Hebborn himself found this prejuidice particularly abhorrent, as he argued that drawings were a far more interesting tool for understanding an artist’s creative process, and that more often than not they were the only part of an artist’s oeuvre that were actually completed entirely by the artist (which in hindsight seems incredibly ironic). In his later career, after his exposure as a foger and stint with fame, Hebborn claimed that he had always been trying to demonstrate that an artist’s drawing style, for all that it was inherently unique, could be easily replicated and recreated by an artist hundreds of years who happened to be properly in tune with the original artist. This could be achieved, he said, by retracing the starting point of the drawing, and from there follow the progression of the drawing as the artist intended, thus eliminating any hesitation that could give the forger away. In short, his forgeries were academic experiments in deception, and if anyone fell for them, or later sold them for what they were not, that was not his problem. One of his favorite artists to forge was Piranesi, an Italian etcher and engraver of the eighteenth century best known for his fantastic renderings of an idealized Ancient Rome. Hebborn first came into contact with his work while on a scholarship to Rome in the early 1960s. One day Hebborn came across one of his drawings, Part of a Large Magnificent Port Used by the Ancient Romans. Hebborn’s later defense was that he felt the drawing was not Piranesi’s best work, and that the Italian master had somehow failed to get across the real image he intended due to constraints of the paper. So Hebborn decided to recreate it “as Piranesi intended”. He blew up the scale of the drawing and tampered with the proportions until he felt it looked perfect, then sold it on. 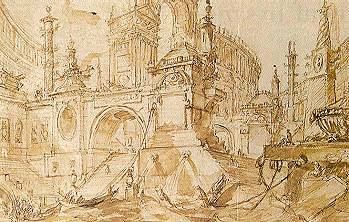 The drawing was authenticated as a genuine Piranesi countless times, and ended up in the National Gallery of Denmark. In fact the Danish museum refused to admit it was a forgery until Hebborn himself claimed the work as his own on the BBC. Now why did I tell you all of this background? Because during my research of my dissertation I came across a catalogue raisonné of Piranesi which included Hebborn’s drawing as an original. I can still remember how stunned I was sitting there, looking at a fact given to me in a book that I knew categorically to be false while knowing that there was nothing I could do. It still bothers me that people will misinterpret that book and continue using false information to try and build solid academic conclusions about Piranesi’s work. It was at that point that I realized that the search for art forgeries is not just about revealing the fraud but also about preserving the real, as corny as that might sound. I can tell you one thing. I darn near defaced a library book to give future readers of that copy the real provenance of that drawing, then remembered that two wrongs do not a right make. Although I still sometimes wish I had. I recently purchased a Piranesi while in Rome (title rovine dell’acquedotto claudio s stefano), however when researching it online it seemed to differ from the other images of it I found. While looking into Piranesi forgeries I came across this post and wondered if Eric Hebborn may have forged it. Do you know of the best way to authenticate a Piranesi other than amateur sleuthing online? Thanks! Is it a Piranesi preparatory sketch or actual engraving? If it is draft sketch then variation between different versions is not uncommon, and even between editions of an engraving. Fortunately Hebborn only did drawings so if you have an engraving then you can rest assured Hebborn didn’t touch it. Older works are a challenge to authenticate, but a good place to start would be to check out your local library’s listings of books outlining Piranesi’s collected works, either a catalogue raisonne or even an exhibition catalogue. If you can get your hands on a thorough catalogue raisonne that was printed within the last few decades, it might mention your work in there. For more scientific proof you might want to consider going to a local art conservator/restore of works on paper. Hope this helps, let me know if I can be of any further assistance. We recently had a Piranesi exhibit at one of the museums in town so I’ll go by there and maybe someone may know a bit more about it or can get me contact information for someone nearby who would. I’ll also check out the library per your suggestions.